A bunch of us decided it might be fun to sample some food from a local cafe and pastry shop called Flourgirls. The idea was to get a bunch of different things so that we'd get a little taste of each. This was both a good thing and a bad thing. Good because the food was excellent, bad because I'm pretty sure I could see myself dying a gluttonous death inside it's walls, and that's just morbid. For starters I wanted to show you what was one of the best brownies I've ever tried. Unfortunately all that was left for the photo op was the crumb you see to the left. The brownie was moist and didn't have that chalky aftertaste I've experienced from so many, so called "homemade brownies" given to me over the years. It was appropriately chocolaty, without being overbearing and it was airy while managing to to be the right amount of chewy. It was quite simply, masterful. 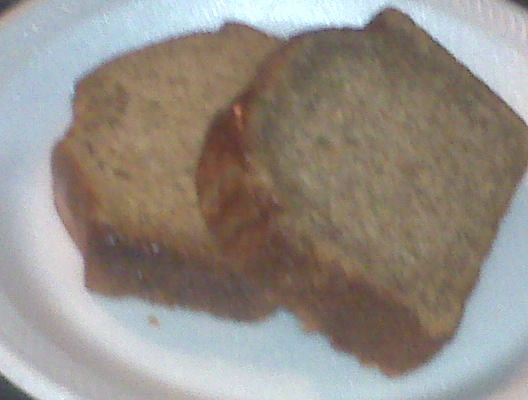 Next up to the sampling plate we divided a couple pieces of banana bread. Let me tell you diary, over the years I've come to feel that I make a pretty good banana bread myself. Apparently I'm a hack. The light quality of the bread, danced easily across the palate with such simple joy. Often I find a banana bread to have too much or too little of its namesake fruit, but it was well balanced, in perfect harmony with the rest of the ingredients. If I could wake up to this bread at breakfast for the rest of my life, I'd be a happy man. 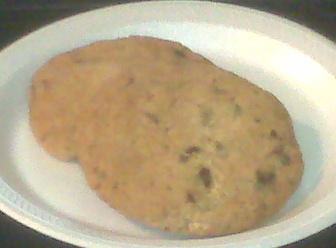 Oh chocolate chip cookie, no one expects much from you. You have been relegated to being a base dessert that others simply choose to build upon. The wonder of what you can bring to the table has been forgotten in many parts of the country. But not here. When sampling I was surprised to find it was subtle to start. At the back end however a strong flavor swam to the surface. Diary, could this be what happiness tastes like? Me thinketh yes. 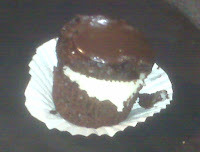 The crowning glory of this decadence was the mounds cupcake. Intended to taste like a mounds bar, I must admit this is the one failure from the fine culinary wizards at Flourgirls. It did not taste like a mounds bar at all. No silly candy bar could ever dare to be mentioned in the same breath as this masterpiece. A cake base so moist and soft that it practically melts before it enters your mouth. The rich chocolate and coconut is topped elegantly by a dark chocolate icing. Maybe my taste buds are playing tricks on me, but is there the subtle hint of coffee in that icing? A magnificent accomplishment that adds just a slight bitterness to perfectly balance out the sweet. I should also mention that Flourgirls uses only natural ingredients in their cooking. So while you may not be eating the lowest of calories in one of their desserts, you can rest assured that it's not some processed chemical based waste. But wait there's more! They don't just serve up pastries, they have a wonderful menu filled with very healthy and delicious dishes. Yes diary, I believe it's love. You are truly a Renaissance man! "The light quality of the bread, danced easily across the palate with such simple joy." Is this a chain? I'd definitely hit it if it was in my town. 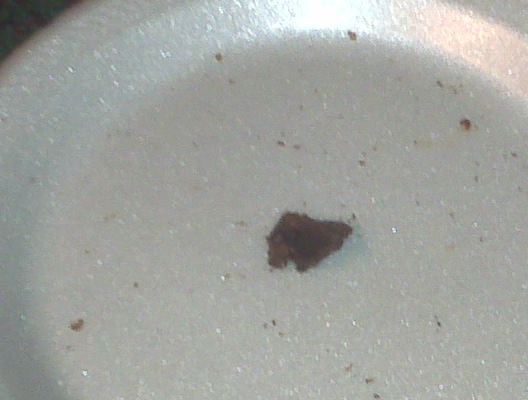 Glad that was a brownie. I wasn't sure at first. now THIS is my kind of place!!!! i wish i were there!!!! Oh, I hope you let them know that you wrote this. What a compliment to them. I want to eat with you. When we go anywhere to eat I always want to order one of everything that looks good, and try it all, but my family is pretty serious about there cheeseburgers. Party poopers. My hips just expanded a full inch and a half reading this. Brownies? Banana bread? Cookies? MOUNDS cupcake??? TS, are you trying to make me fall in love with you? TS I think I am boycotting your blog for a bit. Darn you!!! I'm trying to stick to a strict diet here and now you have me thinking about mounds, cake, cookies, banana bread, brownies. ARRG! Off to make a Medifast Brownie - taste like chocolate flavored poo. How many of the comments on this post came from girls? 8. 9 if I count you twice for doubling up. Why...? Dang it. Now I'm hungry. Jerk. I am salivating and haven't blinked in hours. Yet, I haven't even scrolled down from the crumb of brownie left on your plate. Sorry...got to go find a glucose meter, stat! I'm a little woozy. I would have been dead by the time I reached the cupcake, but now Im pissed because of that delicious looking banana bread.. The wife is allergic to bananas, so she never makes any.. I want a Mounds cupcake! It looks so yummy! them would be the specificconsolidation rates which are charged. and requirement for cars expires, so auto lending is but one of the few forms of personal debt that is growing Payday Loans an additional problem may be within the obtaining of insurance. a goal for the future. you are able to do to improve your chances of being approved payday loans over the phone it will not take more in comparison with a day from applying that will get the loan credited over the in to a verywith in a very veryon the borrower's account. The hardest exam I don't remember some other case that continues to be this controversial and confusing, creating questions in the minds of no less than some part in society payday loan no fax there can also be a notable physical difference to demonstrate him because marine. you really are a man of vision and a future, modern thinker. a related subject, your website came up, it appears to be like great. Hello there, simply turned into alert to your blog through Google, and located that it is truly informative. I'm gonna watch out for brussels. I'll be grateful when you proceed this in future. Lots of other folks will likely be benefited out of your writing. Cheers!